Here’s a great example of what happens you muster the courage to put what you love to do out there in the big wide world. 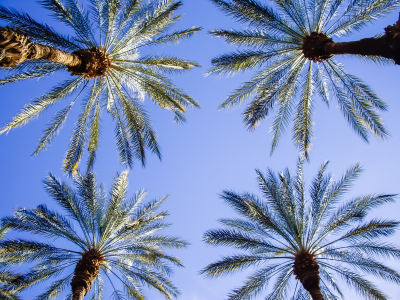 I never cease to be amazed what connections you can make through the magic of social media and blog platforms. What’s even better is when you get the chance to meet those people face-to-face and share conversations about passions and pastimes. So it’s a big THANK YOU to Deb Reynolds, one extraordinary Canadian, who pointed me in the direction of this post this morning. Thanks for noticing the tanka love coming from this direction Deb, and for helping to open up my knowledge of how others are using and adapting the form. A container such as verse form is useful to get the writing started. It doesn’t have to mean you’re ‘stuck’ with the format. Enjoying the playfulness of it is an important place to start. This book review of a collection by Harryette Mullen is from National Public Radio. With these tanka forms, the 31 syllables goes into 3 lines, but not necessarily fixing the number of syllables for each line. Here’s a taste. with goji berries or Aztec flavored with smoky chilies. The review’s author Carmen Giminez Smith writes about how Mullen marries the modern with the older form. 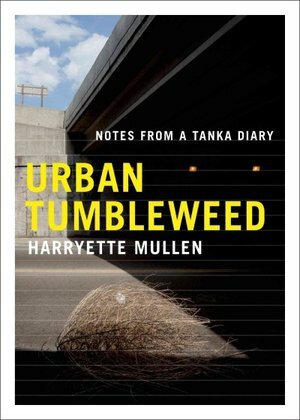 Poet Harryette Mullen makes a beautiful marriage between those new ideas and a classic poetic form in her first collection in over a decade, Urban Tumbleweed: Notes From a Tanka Diary. The tanka is a Japanese form dating back centuries. It’s a 31-syllable poem that usually includes what Mullen calls “a refined awareness of seasonal changes and a classical repertoire of fleeting impressions.” In Urban Tumbleweed, Mullen has written 366 tankas, describing a year of living in Los Angeles and traveling to places like Texas, Ohio and Sweden while taking careful note of the natural world around her. Here’s some more about Harryette Mullen and her work. So many poets, so little time! Some more fun with word play. 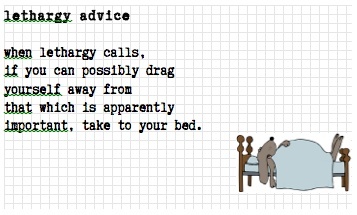 Many of us are familiar with the Japanese haiku form of verse. Here’s another one, with which I was unfamiliar until recently. 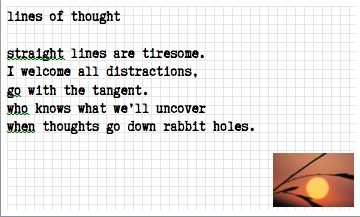 Shadow Poetry has a good explanation of Tanka. There are, of course, many more subtle components of the verse than its 5-7-5-7-7 or 31 syllable shape. You can always aspire to reaching higher expression of the form. In the meantime, it’s fun and satisfying to play with it as a container. 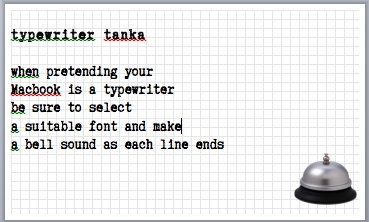 If, like me, you are in the habit of writing down the odd phrase that occurs to you, the Tanka provides a good starting point to use the idea. In this case, my phrase was the sound of one frond dropping.